In the new study, the researchers found that an amoeba can find reasonable (nearly optimal) solutions to the TSP in an amount of time that grows only linearly as the number of cities increases from four to eight. Although conventional computers can also find approximate solutions in linear time, the amoeba's approach is completely different than traditional algorithms. As the scientists explain, the amoeba explores the solution space by continuously redistributing the gel in its amorphous body at a constant rate, as well as by processing optical feedback in parallel instead of serially. "Of course, running some other algorithms on traditional digital computers for linear time, we can derive approximate solutions to TSP. On the other hand, when running our simulation models (AmoebaTSP or its developed versions) on the traditional computers as we did in this study, the analogue and parallel spatiotemporal dynamics require nonlinear time for simulating them as digital and serial processes. So we are trying to obtain much higher-quality solutions than those derived from the traditional ones by running our models on the analogue computers for linear time or shorter." It is already known that NP-hard problems are not "NP-hard" if all you're after is a heuristic solution, of which many algorithms exist. 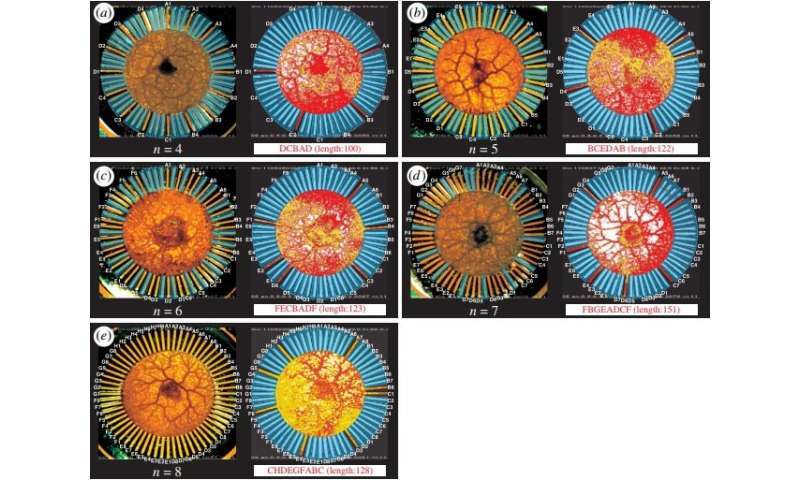 "the amoeba explores the solution space by continuously redistributing the gel in its amorphous body at a constant rate, as well as by processing optical feedback in parallel instead of serially." It sounds like a parallel variant of branch and bound [ https://en.wikipe...nd_bound ]. I think part of the problem is that there is no generic heuristic in such cases, but you have to meta-explore those as much as they explore the solutions and, worst case, derive new ones (as they laid the groundwork for here). If I were a travelling salesman why would I bother about travelling through the same city twice (given that I don't have to stop there)? Given the non-trivial set up requiring a neural network to run the amoeba, wouldn't processing the solution require combining the resources spent by both the computer running the NN and the amoeba? Given that the processing cost is then the combination of the two systems, does this really represent a reduction or optimization of resources?